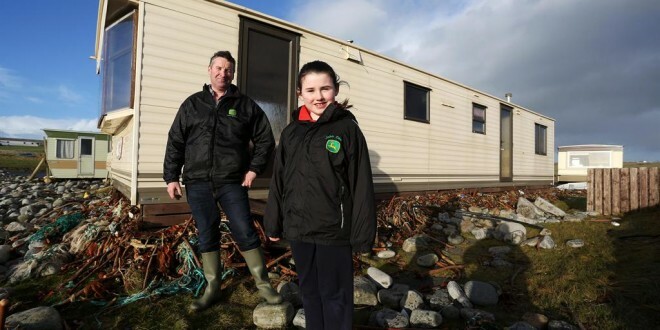 8 year old Edel Sexton and her Dad Noel surveying their storm damaged Caravan Park, White Strand Miltown Malbay Co Clare. Pic Arthur Ellis. RESIDENTS and business people along the Clare coast have spent the past week cleaning up after the recent storms. Clare County Council is looking for more than €23 million in funding from central government for work on public infrastructure but extensive damage was also caused to private property, including homes, by Storm Christine. Now, people with houses and businesses along the coast are wondering and worrying how they will pay for the damage done to their property. Noel Sexton owns White Strand Caravan Park outside Miltown Malbay. “I will have to pay for the damage myself,” he told The Clare Champion. “There are a lot of stones washed up onto the caravan park and sections of it were washed away with sea. The stones will have to be brought back down. I will have to get a machine in to do that. I will have to pay the man with the machine. The part that washed away was about a quarter of an acre. What is left now is just the shore. One of the caravans here was badly damaged by the high tide. The waves hit it and damaged the side of it. I don’t own it but I would say that it is beyond repair,” he added. Noel plans to reclaim the piece of land that was lost. “It has to be all filled back. I will reclaim it either on my own or with the help of the council but, more than likely, it will be on my own,” he said, adding that he hopes to have the work completed before the beginning of the tourist season. Despite watching as the wall outside his house at Clahane, Liscannor was knocked by the “frightening” swell, publican Patrick T Sexton is more worried about repairs and coastal protection in Doolin. While his pub, O’Connor’s, received only minor damage in the storms, Patrick is worried that tourist numbers could be affected if the public infrastructure in the area is not repaired immediately. Patrick was in his house when the garden wall was knocked by the power of the tide. “The tide knocked all our front walls. St Stephen’s Night was a lot windier but the high tide combined with the wind meant the water came right up. I was in the house at the time. The damage there happened over two nights. On the first night the water took half the wall; on the other night it took the rest. The houses beside mine also had their walls damaged. It was frightening but as long as it stayed outside, it wasn’t too bad,” he said. Patrick paid tribute to Clare County Council for the works they have already undertaken on the road at Clahane. People around the world saw images of the badly damaged Doolin2Aran Ferries office at the pier. “We have a couple of offices up on the pier and one of them was completely gutted with the water and also with the debris that came, including stones and rocks. There was about 3ft of stone and silt in the office and the electrics were completely trashed. “The doors and windows were blown in and the flooring was destroyed. The offices were moved themselves. We have been working on those in the last few days. We have reinstated them now with boulders and tying them back with ropes,” said Eugene Garrihy from the company. According to Eugene, it is difficult to assess the value of the damage done because the family is doing so much of it. “We couldn’t get insurance for those types of offices on such an exposed coastline. Our insurance company wouldn’t cover us for such events. So we are covering that cost ourselves. We have to pay specialists for certain things but listing a figure would seem insignificant when compared to the €23m Clare County Council is facing. The cost of repairs would be significant in our company,” he said. Eugene hopes the offices will be fully repaired within three weeks and, like Patrick, he is eager to see the necessary repairs carried out on infrastructure leading to the pier and the safety railings and ladders replaced. In Ballyvaughan, O’Loclainn’s Bar escaped damage but proprietor Peter O’Loghlen is worried about the stability of the old pier in the village. “I feel there should be an in-depth study done on the pier to see how safe it is. There was a slipway off the car-park wall; it acted like a runway for the water. When the water hit that, it took off up onto the land and that is when it hit the wires. Once the wall was breached, the heavy swell put the water over the electricity wires in the village. It was that height,” he recalled. While Peter lives about 150m from the water, 30 years ago his home was right on the seafront beside Monk’s Bar and Restaurant. “There was a lot of debris on the road there. The wall was breached right in front of Monk’s, which people here have never seen before. That is when the damage was done,” he said. Peter’s cousin lives close to the old pier. His home was flooded before Christmas but the new year storms brought more devastation. “He had parked his car at the side of the house. After the sea breached the wall, when the swell was going back the car was lifted and left on top of what was left of the 3ft wall,” he outlined. Work on the public areas must be undertaken right away, he says, but believes that the €3,000 funding estimated by Clare County Council “wouldn’t even pay for the cement”. “If we get another high tide and a south-west wind, there is nothing to stop it all happening again,” he said. Meanwhile, damage at Kildysart/Ballynacally and Doonbeg Golf Club, understood to total more than €625,000, was not included in the council’s report to the Department of Environment, Community and Local Government. It was decided at last Friday’s specially-convened meeting of county councillors that a letter sent to the department with the report should state that an estimate on the cost of coastal protection works at those two locations, as well as at Shannon Airport and the embankment in Shannon, would follow. According to Councillor Oliver Garry, works at Kildysart/Ballynacally would cost in the region of €350,000. “The farmers in the local area got photographs and ordinance survey maps and marked all the damage. They passed them on to Clare County Council,” he said. Farmers in the area, he said, are resorting to attempting to do repair works themselves to ensure they are prepared for the next spring tide on February 1. More than 1,000 acres was flooded in the area during the recent storm. “There were some repairs done three years ago in the Fergus Estuary near Ballynacally, at Inisdea. What happened there is that Clare County Council administered the funding for the OPW, so they had costings done for that at the time so they applied the same costings to the present breaks. We submitted the length of repairs that had to be done and all the breaks in the area and they made up the costings from that,” he said. Farmer John Joe O’Sullivan confirmed, “The water is gone but the damage remains. We’re fixing the banks ourselves.” Up to 25% of his land was flooded. “They [embankments] were broken before; we fixed them before and we’re doing it again now. It’s to save our farms. The fact that we weren’t included in the initial funding calculation, people took it upon themselves to go at it again and repair the banks as they have done for the last 30 years. People are taking it on at their own cost,” he added. John Joe said the farmers affected had to take immediate action or their land could deteriorate further. “We had no choice but to go at this. There’s a tide coming again on February 1 and it will treble the damage if we don’t make some attempt to repair it. That’s what we’re doing at the moment. I expect we’ll be the last to get funding and I understand that. But I would love if there was more clarification going forward with regard to the banks,” he said.